아래의 이미지를 보시면 딱 아시겠죠? 아래의 패키지도 같은 기능을 합니다. 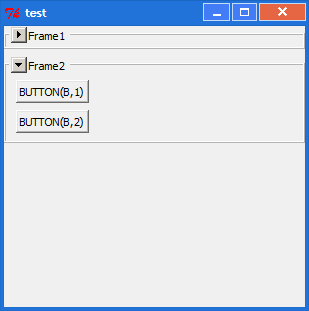 # Provide a collapsable labeled frame widget. # CollapsableFrame pathName ?option value...? # -text Text to dispay in frame. # -width Width of frame. # -borderwidth Width of displayed frame border. # -height Maximum height of the frame. # Pathname of the frame container. # pathName open Open/expand frame to reveal contents. # pathName close Close/collapse frame to hide contents. # pathName toggle Flip state. # pathName getframe Returns path to the widget container. # pathName title string Set title to new value. # Arrow Button-1 Open/Close frame. # This module includes a demo proceedure. Delete and/or comment out as required. # Work still in progress. # As always, programming is an art. Like a painting, it is never finished. # Good programmers and artists have one critical faculty in common: knowing when to stop! # frame is sufficient to accomodate all items. # Use the place geometry manager to explicitly position child widgets. # Check the current widget state then reverse it. # Collapse the widget, display the 'can be opened' icon. # Open the widget, display the 'can be closed' icon.